The HTC Butterfly is a high-end smartphone that has been somewhat blighted by a very low-key launch from HTC which has led to it sneaking into some markets pretty much by the back door. The Butterfly has a bigger screen than the well-regarded HTC One but a slightly slower processor, and it also lacks the One's exquisite design. There's not much to choose between them in terms of features, although the Butterfly is perhaps a little bit cheaper than the One, costing around €500 to €600 SIM-free. The display is a 5" full HD 1080 x 1920 pixel LCD3 panel, on the back is an 8 megapixel camera with 1080p video capture plus a 2.1 megapixel one on the front. Inside is a quad-core 1.5GHz CPU with 2GB of RAM and 16GB of flash storage plus a microSD slot. The Butterfly has an FM radio, NFC support, LTE in certain markets and GLONASS as well as GPS positioning support. HDMI output is supported via an optional MHL cable. 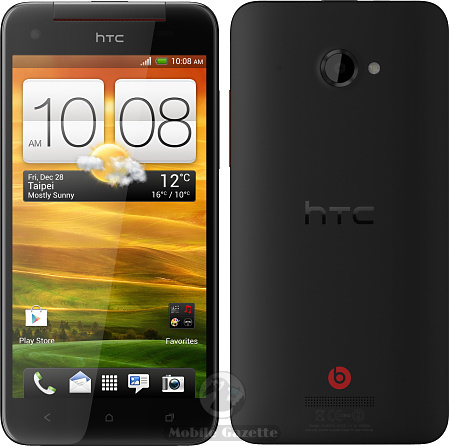 Music playback is enhanced with Beats Audio, and the Butterfly's Android 4.1 operating system has been improved with the usual HTC add-ons, as has the camera. The Butterfly measures 143 x 71 x 9.1mm, weighs 140 grams and has a 2020 mAh battery. One useful and somewhat unusual feature is that the Butterfly is fully waterproof and is dust resistant. The Butterfly is available in a very limited number of markets in Europe with some specialist retailers carrying it too. You are much more likely to be offered an HTC One by your carrier, and that is probably the handset we would go for, although the Butterfly remains a very desirable device.